The Jewish federations in the United States exist to support charitable causes in the Jewish community and in Israel. They indeed redistribute most of the money they raise. But research into their public records shows that many don't stint with their own executives either. Furthermore, some federations have debatable organizational and financial practices involving executives present and past. The federations are nonprofit organizations with tax-exempt 501(c)(3) IRS status, which means donors can deduct donations from tax. They range in size from minnows to whales. For instance, the Rockford, New York federation fielded about $40,000 in contributions and grants in 2015, while the Boston, Massachusetts federation collected $390 million that year. Together, the 138 Jewish federations in the United States raised over $5.7 billion from 2012 to 2015, and distributed more than $3.6 billion in the U.S. and in Israel. But plenty seems to have stayed at home. When you make a tax-deductible donation to your local federation, where does it actually go? In Akron, Ohio, it might support the local chapter of Jewish Family Services. In Memphis? The JCC. In Boston, some of your donation might have ended up in the $1.34 million one-time bonus paid to federation president Barry Shrage, on top of his $562,802 wage cost in 2015. On its 263-page Form 990 (returns for organizations exempt from income tax), the Greater Boston’s Jewish Federation explains that the bonus is “toward Mr. Shrage’s retirement to reflect the accomplishments over the course of his career” of 28 years. Shrage’s compensation is determined by the Organizational Development Committee, which reports to the board, explains chairman Neil Wallack, based on an analysis in 2014, by an outside consultant and a financial advisor, of his "historical compensation and to assess the resources needed to provide Barry with sufficient retirement funding within the limits of reasonable compensation... after careful review and consideration, CJP’s board of directors approved a one-time additional compensation payment towards Barry’s retirement in the amount of $1.34 million." In general, Haaretz has found that 21 percent of the donations the Jewish federations collected between 2012 to 2015 was spent on salaries. That's a fifth. Note though that the federations' income stems not only from donations, but also from income from activities, investments, and more. Altogether, between 2012 and 2015, the federations spent $1.1 billion on wages. How does the compensation for executives compare with the charity world in general? According to a 2014 report by the Nonprofit Times, the average salary of a nonprofit CEO with an organizational operating budget over $50 million is $317,000. 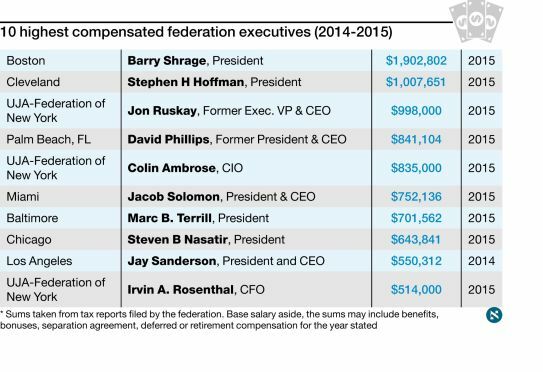 Data collected from the federations' reports to the IRS reveal 20 CEOs at Jewish federations, twelve of which have budgets under $50 million, declare much higher figures. Haaretz approached the highest earners within the federations. Their various comments tell much the same story: The people in question lead huge organizations and bring in a lot of money; their income is determined by volunteer board members; and the figures at the tax reports represent not only the salaries, but also retirement or deferred compensation, bonuses and benefits. These sums, in the tax reports, fall under the title “other reportable compensation”. Between 2012 and 2015, Stephen Hoffman, president of the Jewish Federation of Cleveland, received a base salary of just over $2 million (over half a million per year). On top, he received over $1.2 million in "other reportable compensation". Dahlia Fisher, the federation’s director of marketing and communications, wrote by email that Hoffman, who served at the federation since 1974, “is nationally and internationally recognized as a thought-leader in Jewish communal-life, guiding one of Northeast Ohio’s largest grant-making organizations and one of the country’s top fundraising Federations, per capita.” His supplemental plan was established over 30 years ago by a committee of volunteer lay leaders, says Fisher. If an organization is paying more than the norm, it needs to prove why, says Lisa Runquist, an expert on nonprofit law. "As Jewish population and identity in North America has changed over the past few decades, so have the services provided by Federations," the JFNA commented. "In addition to grant making, nearly one-third of all Federations have become 'integrated;' taking on the direct responsibility for delivering programs and a myriad of community service functions which in the past might have been delivered by separate agencies. Organizations that provide such services have much higher personnel-related costs than organizations that focus on providing grants or distributing donations to individuals or other causes." Meanwhile in Chicago, on top of his annual $422,000 salary at the Jewish Federation, President Steven Nasatir will be getting $55,000 each year for life and has a $1 million death benefit. Money "on top" consists of things like employer contributions to retirement plans, the value of employer-provided health benefits and so on. Executive VP and CFO Michael Tarnoff is paid $148,600 a year and also gets $30,000 every year until 2019. He has an $800,000 insured death benefit. David Rosen, senior VP Endowments, will get $25,000 annually from 2018 to 2028 on top of his base compensation of $298,800. His total reported compensation for 2015 was $466,506. The senior VP for Financial Resource Development, Jeffrey Cohen, gets $180,917 a year plus $21,000 annually from 2013 to 2023. Beth Cherner, campaign VP, received a $97,316 severance payment in 2012. Her total compensation that year, including base salary, deferred compensation and nontaxable benefits, was $265,606. The federation also lent $30,000 for a “promissory note” to chief investment officer David Brief in 2012. It declined to explain the purpose of the loan or of the promissory note. These financial arrangements “were determined by the federation’s Compensation Committee based on a variety of criteria, including job performance, length of service, and national compensation surveys,” says Aaron Cohen, the Chicago federation’s VP Communications. “The salary information you provided is incorrect; in fact, Dr. Nasatir’s 2015 salary was considerably lower, at $551,176," Michael H. Zaransky, the federation's chairman of the board, wrote to Haaretz. "The remainder of his compensation represents health care coverage, retirement benefits, and insurance. Regarding the $1 million insured death benefit for Dr. Nasatir, upon his death Chicago’s Federation will receive cash proceeds reimbursing all the premiums paid. "Dr. Nasatir leads the second-largest Jewish Federation in the nation, and has grown it to be a $1.9 billion organization with total fiscal-year '17 revenues of $299 million, making it one of the largest not-for-profit organizations in the nation – comparable in size and scope to a major corporation in the private sector," Zaransky added. The federation president’s compensation is determined by a compensation committee comprised of volunteer leaders, Zaransky continued: the chairmen of the board, audit, and budget committees as well as the immediate past board chairman and external counsel. "In a documented, annual review process they analyze comparable data from other large nonprofit organizations to ensure compensation for Chicago Federation executives is consistent with the market," Zaransky wrote. No other federation listed a similar number of benefit agreements with executives in their tax forms. Some pointed to salary studies by third-party consultancies, or JFNA itself, as the basis for salary and benefit arrangements. In Miami, Jacob Solomon was reporting as having been paid over $750,000 in 2015. The federation said his pay was overstated: "His actual compensation for 2014-2015 includes salary of $345,807 and Retirement/Deferred compensation of $171,281, totaling $517,088. The reason for the discrepancy is that the figure that you used of $752,136 includes an amount of $177,000, which will not be paid out nor considered compensation by the IRS until 2020, if distributed at that time." His pay is benchmarked against comparable nonprofits, the federation added. Palm Beach reported paying David Phillips , former president and CEO, over $840,000 and explaned that the figure does not reflect salary but a separation agreement, based on a multi-year, total compensation package, inclusive of salary and benefits. The compensation complies with the federation’s policies and procedures, it stated. At the Jewish Federation of Greater Philadelphia, according to the tax returns, Ira M. Schwartz was paid $1.5 million over three years, 2013 to 2015, though he served as CEO of the federation for only a portion of 2013, alongside interim CEO Alex Stroker. In 2013 Schwartz got over $493,000, including $50,000 for bonus, nontaxable benefits, and deferred compensation. In 2014 and 2015, when he was no longer CEO, Schwartz got over $921,000, of which $82,491 was from a supplemental retirement plan; $841,000 was from a separation agreement paid by the federation. Naomi Adler, CEO of the Philadelphia federation today, explains that others were offered a supplemental retirement plan "but only Mr. Schwartz wanted to participate.” The plan “is 100% employee contributions and our organization does not match these funds,” she clarified. Based on data from the Nonprofit Times, CEOs at nonprofits with similar operating budgets ($50 million or more a year) earn $317,000 a year on average. Regarding Jon Ruskay, Colin Ambrose and Irvin Rosenthal of the UJA-Federation of New York: "The UJA compensation process is deliberate and thorough," commented Emily Kutner, PR director at the UJA Federation of New York, adding that the compensation committee works with the accounting firm of PwC to determine the reasonableness of executive compensation. "PwC evaluates market data regarding comparable executive positions in similar organizations in making its assessment of reasonableness. The compensation for the three individuals you refer to was set by UJA’s compensation committee" in keeping with that, she wrote. "In fact, compensation paid to these UJA executives was at or below the 75th percentile when compared to the range of compensation data reviewed by PwC for comparable organizations." Emily adds that compensation reported in 990s includes salary, benefits and deferred compensation. In Ruskay’s case, $252,000 of the $746,000 represents a cash distribution from his supplemental executive retirement plan account of amounts that were accrued in prior years and reported then; "As noted on Form 990, a significant portion of Mr. Ambrose’s compensation represents an industry-standard performance bonus, reflecting best practices in the industry." His bonus was based in part on returns on UJA’s investments, she added. No comment was forthcoming from Marc Terrill of Baltimore. Jay Sanderson of Los Angeles addressed the role of the federations: "How do Federation Executive positions compare to these other non-profits? How do you value each position and job performance? I am deeply proud of my work and my 24-7 commitment to my community and to the Jewish community. Federations are essential to the past, present and future of the Jewish people. “Do the donors to the federation know that some of their dollars fund a loan to you?” I asked. “They can see it in the 990,” he replied. Asked if Haaretz could see the loan agreement, he referred me to the CEO. The loan was for an “interest-bearing, secured mortgage for his primary physical residence,” said Bonnie Reiter, the Miami federation’s marcom chief, adding that its status is reviewed annually by the Federation’s Compensation Committee. Levin's outstanding balance in 2015 was $352,151. Oksana Cardini, CFO, told Haaretz that Levin “does not have any authority in the matter of his loan or compensation” and has no conflict of interest. Tax returns that Haaretz saw show the loan to Levin to be no exception. Executives in federations across the U.S. have received loans from their employers, in states where the practice is legal. But no federations would share the terms of loans with Haaretz. “In some states, it’s illegal for charities to make loans to officers and directors. In New York, for example,” says Marcus Owens, a D.C.-based lawyer specializing in nonprofit tax law. “Many states frown on the practice, even if it’s not illegal. You know, the charities are not created to loan money to their officers and directors, they’re created to use their money for charitable purposes. At the federal level, there’s no prohibition on loans, except that the terms and conditions are closely scrutinized, because of that sense that it does suggest sort of a related party transaction." For example, nonprofits may lend money to help executives move to prime areas like Manhattan or Silicon Valley, says Owens: Buying a home in Palo Alto could cost five times the price in Cincinnati. In 2014 and 2015, the CEOs at the Jewish Federation of Greater Washington received loans for that purpose, according to Stacye Zeisler, the federation’s chief marketing officer. President and CEO Keith Dvorchik was lent $100,000 in 2014, and executive VP and CEO Steven Rakitt received $75,000 in 2015. The loans were approved by the federation executive committee and are retuned with interest, Zeisler says. Michael Rassler, executive director of the Jewish Federation of Santa Barbara, borrowed $150,000 in 2010 to relocate the family. The Jewish Federation of Columbus lent former president and CEO Marsha Hurwitz $239,332 for her primary residence. Cumberland County, New Jersey, lent former director Kirk Wisemayer $80,000 for an “expense advance.” Youngstown, Ohio, lent executive VP Sam Kooperman $16,779 “for personal use." None answered multiple requests for comment. Loans for personal use are what banks are for, says Owens. And as a general practice among nonprofits? “I would say the loans are not common at all,” he says. It can go the other way. In Los Angeles, a federation member lent the organization $3.3 million “at 2 points below market” to rebuild offices after a 1994 earthquake. Maybe the federations also lend on sweetheart terms? We don't know, because they insist on confidentiality.